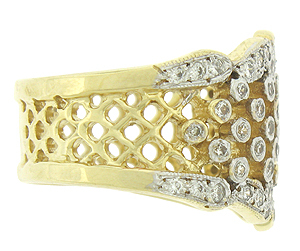 A golden trellis, punctuated with brilliant round cut diamond "blossoms" covers the face of this breathtaking antique style wedding band. 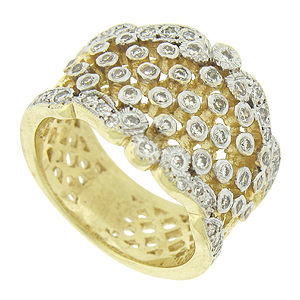 The scalloped edges of the ring are frosted in white gold and set with additional fine faceted diamonds. 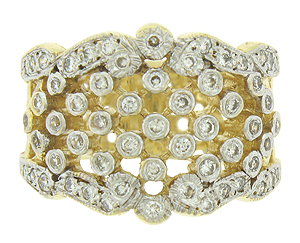 The antique style wedding ring is fashioned of 14K yellow gold and set with approximately .75 carats of round cut diamonds. 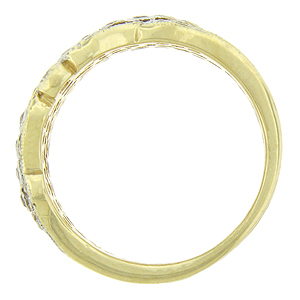 The ring measures 15.22 mm in width. Size 6 1/4. We can re-size.